Rocksmith. The guitar is what it’s all about. Rocksmith’s appeal is entirely up to your background. 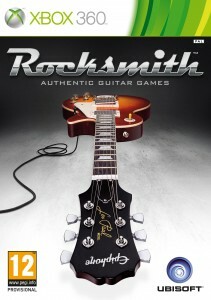 Mine follows: when Rock Band came out in Europe in January 2008, I first picked up a plastic guitar controller. (I’ve had four since.) Two years ago I picked up a real guitar, all thanks to the game. I’ve been noodling with it once a week. It’s just not enough practice to really progress in the art, but I do have the basics of picking and chords and tuning down. I realize that I need way more practice, and it’s just not happening. I would need either friends to play with or lessons to motivate myself. Rocksmith sounded like just the thing – and the cheapest option, to boot! (“Friends” option would also mean getting a practice space.) It’s been a frustrating year, waiting for it to come out in Europe. Rocksmith is basically Guitar Hero played with a real instrument. The skills you build can be transferred as-is to the real world. Just plug into an amp instead of your console (or PC). The first and lasting revelation comes right in the first loading screen. You’re plugged in and during loading you can play whatever. The game and your AV system works as a virtual amp. Just with the default settings – which you can mess around with much as you please – you sound great. The tools do matter. The game is doing some magic to mask your noise (unwanted sound you’re producing), but really just the right effects, guitar sound and amplifier make you sound so much better than through your likely cheap home amp, it motivates you to no end. I’ve been thinking about getting a virtual amp and right now I see no reason to. Moving on to the game proper, it works like all music games do. You’re presented with songs to master and you tackle them one by one, playing virtual gigs to virtual venues. Here lie the game’s problems – it probably would be better off not calling itself a game. Games are supposed to be rewarding. Learning to play an instrument is rewarding… in the long term, but in the short term it demands patience. The way the game constantly ups the difficulty as you’re making progress, all the time keeping right out of reach of your abilities, is great for learning, but makes for poor gameplay. When you’re missing notes, you’re not “making mistakes” or losing points, you’re learning. The game does not reprimand you for mistakes, rather just politely pointing you at the right way, rather like a teacher would. It’s only a problem of perception. The mini-games are designed to teach you basic skills like positioning. Can’t say how long I’ll play them, simple as they are, but as warm-ups they work. I’m more confident in some of my core skills already (finding the blasted 10th fret). The way the game makes you learn everything through playing actual songs at real speeds does wonders to your sense of rhythm. It forces you to start reading with your fingers, because at real speeds you just don’t have the time to check both your hands. Compared to how I’ve been training by myself, this is nothing short of a revolution. Playing on your own, it’s so easy to play just a tad slower to keep up. As a teaching aid, Rocksmith has just one problem and another potential one. The real problem is that the game’s Guitar Hero-y way of displaying the songs you play does not correspond to any real world way of noting music. You won’t be able to read songs based on your time with the game. That’s something you need to learn the hard way. The potential problem is that maybe you’re not keen on the game’s selection of mostly classic rock. I’m fine with it – I don’t actually care all that much what I’m playing, as long as I’m making music. There’s plenty more options available on the download store, too. It’s nowhere near Rock Band levels of choice, but it’s choice. The way you start from single notes, upping the amount of strings and notes as you go, moving on to chords and eventually combinations, allows you to practice at a level that’s most useful to you. Even the single note versions do sounds like music, when played correctly. There’s been talk of lag. Can’t say it’s a problem. I did switch out the HDMI for component cables as instructed and used an analogue cable to my stereo. Apparently the loading times grate some folks, too. Again, can’t say it’s a problem. Maybe if this were a party game, but to me it’s something you fire up instead of grabbing a sheaf of tabs and plugging into my amp. You can play through the virtual amp as it’s loading. The user interface is a bit of a laugh, especially compared to Rock Band 3, but it gets the job done while looking cool enough. Likely if you already can play a number of songs at full speed, Rocksmith won’t be anything beyond a way to master a few more songs to you. It’s been made for guys like me, who just need a little more kick to keep playing. If you were to pick up your first guitar with the game, I think you’d do okay. The game does cover the basics of tuning and holding a pick and so forth. All told, Rocksmith is everything I wanted it to be, and more. I am psyched to get back on the guitar tonight.